Universal AC input from 100 - 240. Over-voltage, over-current protection, under-voltage protection, short circuit protection, over power protection, and over temperature protection provide maximum safety to your critical system components. Safety and Agency Approvals: FCC, ICES, CE, C TUV US, RCM, TUV, CB, CCC, BSMI, GOST, ROHS, WEEE, ROHS, KC, TUV-S.
Cons: I needed four ATX_12V plugs, but this power supply only had three. (Two for the motherboard and two for the graphics card.) 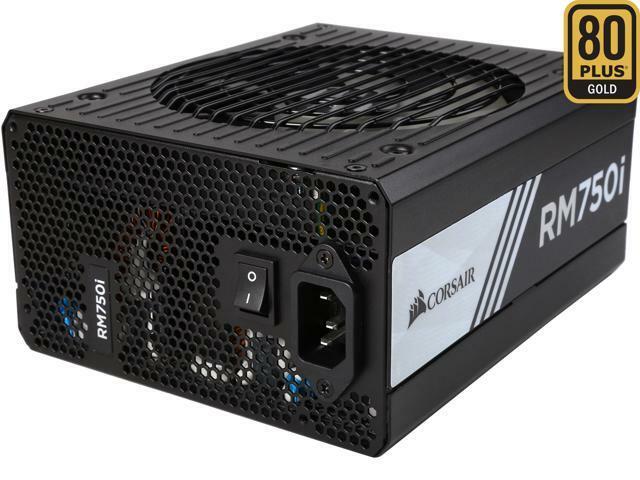 750 W would have been more than enough power, but not enough connections. I had to upgrade to an RM850i to get the four plugs I needed. So I dinged it one egg for connectivity. Other Thoughts: Solid power supplies. I have purchased before and would purchase again. Pros: Excellent build quality in both the unit and the cables. Modular design, has some nifty extras like a connection for PSU monitoring software etc. The "smart" fan speed control is noticeable, this unit is basically silent unless under load. Arrived in a velvet bag, just like my 750 Corsair I bought 9 years ago haha. The bag makes a nice water cooler topic for a few days as people like to joke about the "fancy PSU in the velvet bag" . There is also a very nice, and handy, storage bag for the cables. Little inexpensive to include things like that are just a really nice touch that makes the unit feel premium. Cons: I bought this for my AMD Ryzen/ ASRock Taichi build. I put it into the highly rated Phanteks Enthoo Pro tower case. My only gripe is, as nice as the cables are(super nice quality) for this particular build, I wish a few of the cables were about 4 inches longer. Now, don't get me wrong I think in many builds they would be more than adequate. For my particular layout though, the PSU goes on the bottom of the case, and my 8 pin MoBo power plug was way up at the top rear. The included cable did reach, but I had to route it straight across up the back to make it. If it had been an inch shorter, likely would not have been able to route the cable through the back of the case(as the case is designed to). I would never dock an egg for this, as I think this is an extreme scenario but a few inches on the main mobo power cables would be nice for future reference. Other Thoughts: Excellent unit of good quality, fully optioned model. the 750 Corsair unit I purchased in 2009 is still in perfect working order in my old I7 X58 rig, and I hope this unit gives me brilliant long life service also. Pros: not much to say. Other Thoughts: -Great power supply so far. Able to handle Ryzen 7 1700x, 16gb DDR4 3200, 2 HDD, a SSD, 5 case fans and a Radeon R9 280 with no problem. Looking forward to having this last a long time. Other Thoughts: I tried to keep everything in this build uniformed such as keeping brand names together and not mix everything all up. Such as Intel, ASUS and Corsair all the way through this build and so far no problems. Pros: The power supply looks good, I like how you can plug in and use only the cable needed. Cons: I am using this with a new build, ASUS Crosshair VI Hero, AMD Ryzen 1700. the mother board has the 24-pin, a 8-pin and 4-pin power connectors, the Corsair RM750i did not come with a 4-pin cable. ASUS support tells me that a have to use all three, found one on line and waiting for delivery so that I can finish my Build. Other Thoughts: Yes I would recommend this product, but check if you need the 4-pin cable first.